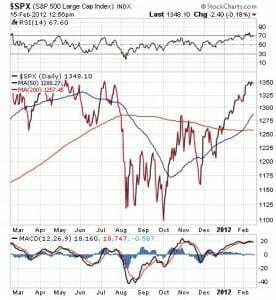 The 2012 rally that got investors so excited through the first five weeks of the year has begun to slow down. In fact, stocks effectively stalled last week, with all three major indices — the Dow, S&P 500 and NASDAQ Composite — finishing in the red for the week ended Feb. 10. Stocks haven’t seen much improvement since then, and the trading remains shaky, with investors wondering if the bull that came out of the gates at the beginning of the year is running out of energy. I suspect stocks are way overdue for a pullback here, and that’s part of the reason why I’ve remained cautious despite the over-exuberant January action. Another reason for my caution here is due to concern about the fledging bailout deal in Greece. The drama continues in Europe, and I think the longer the region’s debt issues linger, the more likely it is that money will continue flowing away from the region, and away from risk assets such as stocks. What I think is the most probable scenario is that this early-year rally will stall and cause things to get dicey. I think we could be on the verge of a strong pullback that’s going to send stocks in the S&P 500 well below their long-term, 200-day moving average. As you can see by the chart here of the S&P 500, stocks have stalled a bit since climbing rapidly to the 1,350 level. Admittedly, the broad measure of the domestic market remains well above both its 50- and 200-day moving averages. In Europe, we’ve also seen a nice rally to begin the year. 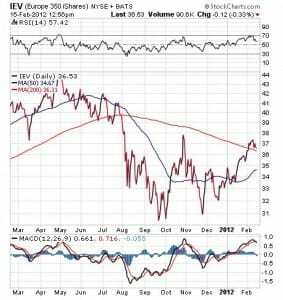 However, the chart below of the iShares Europe 350 (IEV) shows that stocks in the region now are beginning to pull back. Any further downside could lead to a break below the long-term, 200-day moving average. This is the kind of scenario that could very well take place in U.S. markets, particularly if Europe’s recession issues begin to have the kind of negative effect on the global economy that I suspect they will. The bottom line here is that if you aren’t allocated to stocks right now, then I strongly recommend that you steer clear and wait for a more opportune time to get in. If you do own long positions, then make sure you have trailing stop-loss orders in place to protect the gains you’ve seen through the first part of the year. 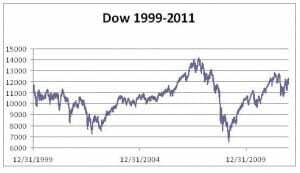 If my thesis on this market is correct, gains will be increasingly hard to come by in 2012, and that means it’s crucial for you to protect and preserve what you have. I think 2012 will go down in history as a time when the global debt bubble came to an end. We surely will witness the first of many sovereign debt defaults this year. We also could witness the end of the euro. But most importantly, we will watch the end of easy money. My friend John Mauldin calls the expected conclusion of the debt super cycle the “endgame.” It is that point in time when governments no longer are able to finance their promises through deficit spending. We also will be selecting a new U.S. president or reelecting Barack Obama this year. In either case, the person who gets the job will have to deal with our fiscal dysfunction of $15 trillion in debt, annual deficits of a trillion-plus dollars per year and unfunded liabilities of many trillions more. This year also will spotlight Europe’s grand experiment of economic union. The growing conflict between euro-zone nations seems likely to come to a head. The wild social promises made by politicians and the strict union rules for employment have ruined the economies of Greece, Portugal, Spain and Italy. A great crash is coming and now is the time to get your personal financial house in order so you and your finances are able to survive the havoc that Europe’s problems will bring to the rest of the world. The global economy is slowing but Europe, the largest economic bloc in the world, is going into recession. The results are clear to me; this global slowdown is about to get a lot worse. If we also get bad news out of China, we could be in for another 2008-style global recession. These charts tell quite a story. You see, there are long periods of time when stocks go nowhere. Such instances occur after we have had long periods of outperformance by the indices. The first secular bear in the 20th century followed a period of time called the roaring ’20s. 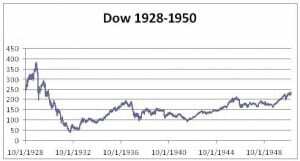 The U.S. economy expanded rapidly and stocks screamed higher during 1920-1929. We all know from our history books what happened next: the Great Depression. Stocks fell more than 80% in value. It took more than 20 years for stocks finally to break out to new highs. Then there was the secular bear market from 1966-1982. This period of time followed the great Eisenhower, post-World War II boom. 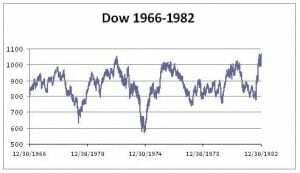 Once again, stocks soared in the ’50s and into the ’60s, only to hit a wall in 1966 with the first of two major bear markets in the span of just 10 years. Stocks did not break out until 1982. This secular bear market took 17 years to come to an end. Now, let’s consider the year 1999. This was the end of the ’90s, a decade when stocks outperformed their historical average by 70%. Stocks compounded during the decade of the ’90s at a 17% annual rate. Add to that situation the decade of the ’80s when stocks compounded at 15% and you can see why this current secular bear dragged along for some time. We now are 13 years into a period where stocks have gone nowhere again. This market sluggishness is no way for us to calculate when this current secular bear will come to an end. But we want to be aware of these long-term trends to make good decisions about managing risk in the years ahead. In my Successful Investing advisory service, the Fabian family has been helping investors manage risk for over three decades. If you’re in a quandary about what to do with your money, then why not check out Successful Investing today. The biotechnology sector has been rising as quickly as a child’s fever. The key question is whether this suddenly hot sector will slow down or possibly cool off in the coming days and weeks. Part of the answer to that question will depend on the overall movement of the market. With the recent rise in stock prices overall, it understandably leads to doubt that the upward momentum will continue unabated. 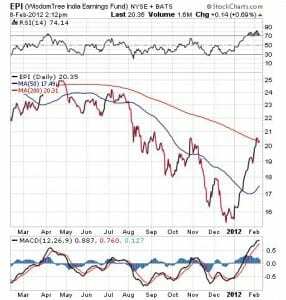 If you are intrigued enough to buy a biotechnology fund, one that you should consider is SPDR S&P Biotech ETF (XBI). The fund’s objective, before expenses, is to match the returns and characteristics closely of the S&P Biotechnology Select Industry Index (ticker: SPSIBITR). The exchange-traded fund (ETF) is designed to provide portfolios with low portfolio turnover, accurate tracking and lower costs. If you like fast-rising funds, SPDR S&P Biotech ETF could be just what you are seeking, since it is up 20.4% so far this year through Feb. 14. Likewise, the index has been surging, too. The index is up 20.12% during the same time period. The following chart shows XBI’s impressive climb so far in 2012. SPDR S&P Biotech ETF held 44 different biotechnology positions as of Feb. 14. Its top 10 holdings, and their respective weights in the fund on the same date, were: Regeneron Pharmaceuticals, 5.56%; Dendreon Corp., 4.74%; Amylin Pharmaceuticals Inc., 4.39%; Medivation Inc., 3.80%; Gilead Sciences Inc., 3.77%; Incyte Corp., 3.62%; Cepheid, 3.52%; Ariad Pharmaceuticals Inc., 3.49%; Alexion Pharmaceuticals Inc., 3.46%; and Vertex Pharmaceuticals Inc., 3.32%. The pharmaceutical industry is high-risk and high-reward in the development of new treatments for diseases. Big pharmaceutical companies often are enticed to buy smaller companies that are developing promising new drugs to treat conditions that potentially could attract a large and highly profitable customer base. For that reason, biotechnology companies can appreciate in value by developing profitable new drugs, or as takeover candidates. I am cautious about investing in equities right now, but SPDR S&P Biotech ETF is on my radar screen as a fund to watch in case the market pulls back and offers a better buying opportunity than we have today. The market has produced a big jump in recent weeks, so caution in allocating to new positions seems warranted right now. If you want my advice about buying and selling specific ETFs, including appropriate stop losses, please consider subscribing to my ETF Trader service. As always, I am pleased to answer your questions about ETFs, so do not hesitate to email me by clicking here. You just may see your question answered in a future ETF Talk. We’ve all heard this old adage, and to be certain, it is the key to income investing success. And while the truth of this statement can’t be argued, it’s definitely a lot easier to say than to actually do. As a fee-only investment advisor specializing in helping clients preserve their capital while also generating the income they need to live the life they desire, we take both of these objectives extremely seriously. However, conventional Wall Street wisdom usually pits the twin objectives of capital preservation and high-income generation at odds. According to the official party line, you can either A) preserve capital by sticking your money in “safe” investments that offer a pitifully low yield, or B) put your money at risk in dividend stocks and other high-yield equities and be willing to wait out the inevitable market declines that are inherent in these kinds of securities. Maybe I’m wrong but who’s to say what’s right? I think the above lyrics from the iconic rock group often express how we who prognosticate on the financial markets feel. In this game, you’re right sometimes and you’re wrong sometimes. The key to success is to be right more than you’re wrong, and to maximize results when you hit the nail on the head. Even as the S&P 500 struggles to break through its resistance level over the past two weeks, your Bull Market Alert picks continue to power ahead. Your holding in Intuitive Surgical (ISRG) broke through the magic $500 level on Monday, and continued to rise in yesterday's trading. With your April $470 call options now up by 59.39% sell half of your options here to lock in some solid gains.